Scientists have for the first time confirmedliquid water flowing on the surface of present-day Mars, a finding that will add to speculation that life, if it ever arose there, could persist now. That represents a shift in tone for NASA, where officials have repeatedly played down the notion that the dusty and desolate landscape of Mars could be inhabited today. 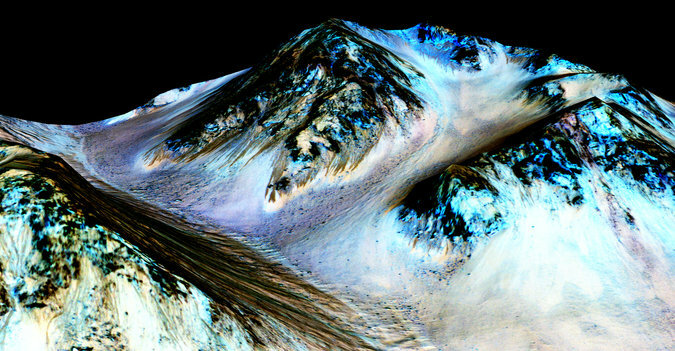 Although Mars had rivers, lakes and maybe even an ocean a few billion years ago, the modern moisture is modest — small patches of damp soil, not pools of standing water. In a paper published in the journal Nature Geoscience, scientists identified waterlogged molecules — salts of a type known as perchlorates — on the surface in readings from orbit. Scientists have long known that large amounts of water remain — but frozen solid in the polar ice caps. 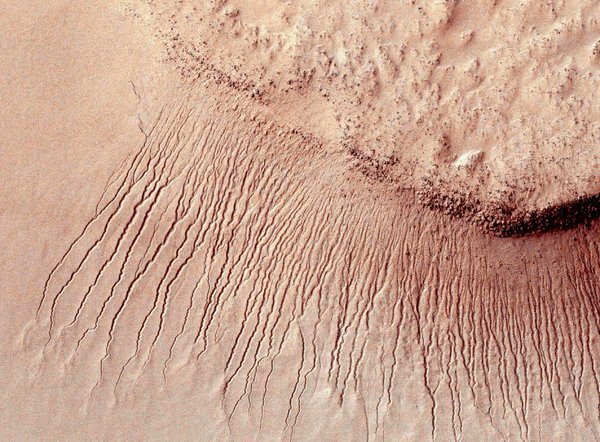 There have been fleeting hints of recent liquid water, like fresh-looking gullies, but none have proved convincing.